Here are some concrete patio ideas to help you design your landscaping project. When choosing a patio, consider the design of the shape, the color and the pattern. Some options to consider are circles, squares, rectangles, clover-shaped, or our favorite - a combination that gently curves and slopes to match your landscape. Take a garden hose or rope and place it in the form of the shape that you would like your patio. Place it in the exact spot you would like the patio placed. Show it to your contractor, take a picture of it, or make a sketch of your house/building with the patio coming off of it. No color is the least expensive option. 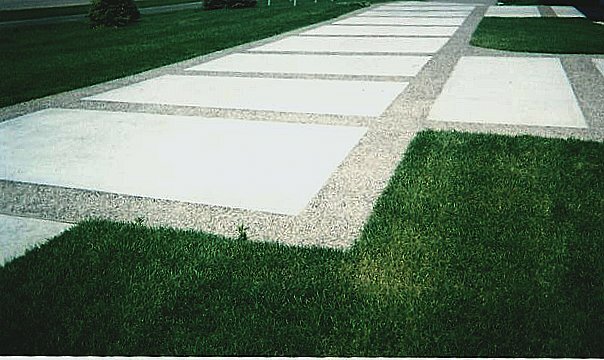 Concrete has a naturally whitish-grey color. This may be exactly what you are looking for. But, color options for concrete are almost limitless. It is our belief that it is best to stay in the neutral color category (greys, tans and browns). Although it is fun to try exotic colors, remember to think about the resale value of your home or property. Exotic colors can scare off future buyers. Also consider the colors of the building your patio will be next to. The colors should complement the building. This is the process of imprinting a texture into the wet concrete. Once dried and sealed, the concrete often looks like a natural stone, brick or wood (depending on what you chose to texture it with). 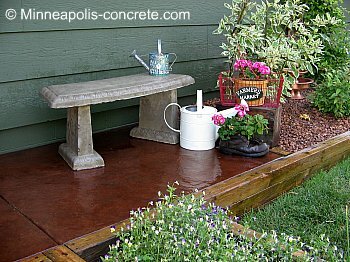 If you already have a concrete patio but want to update it, try a concrete patio stain. A stain will create a beautifully colored patio with all of the color variations of natural stone. The drawback to stains used on standard (no color) concrete is that if the concrete gets chipped or damaged, the grey concrete underneath will show through. Fully colored concrete is colored throughout and small chips won't be as noticeable. In addition to staining, overlays can help to update an existing patio. An overlay is the pouring of a new topping over the existing surface. 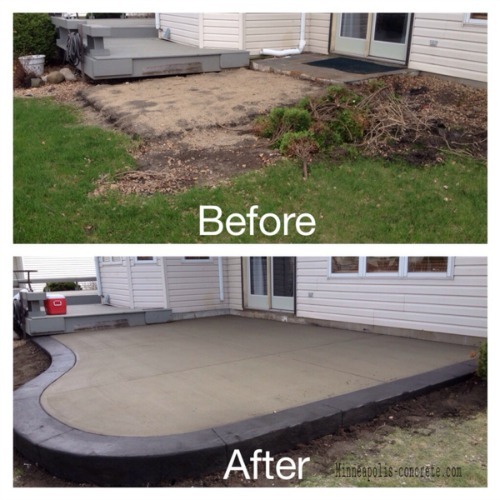 This allows you to texture and color your concrete at a fraction of the cost of tearing out and re-pouring your current patio. This option works best in warm climates. 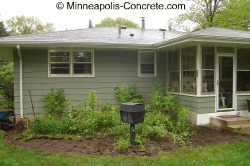 There is a risk of cracking in climates such as Minnesota where the freeze/thaw cycle happens yearly. This is a special type of decorative concrete mix that "exposes" the rocks in the concrete. The rocks are exposed through spraying a retarder onto the surface of the concrete and then washing the surface off to expose the rock. 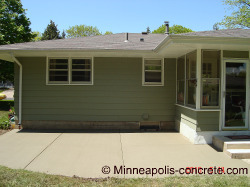 This is a lower cost alternative to stamping the concrete, but still looks as classy. If you want to avoid the cost of full concrete stamping over your entire patio, have your contractor saw cut decorative borders and stamp, stain or color borders only. Standard patio with a stamped concrete border in Italian Slate pattern and Black Ice color. The space was instantly transformed into an inviting area for leisure and entertainment. 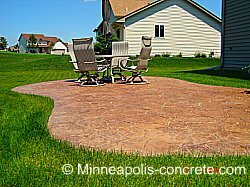 If you live in the Minneapolis and surrounding area and would like a free estimate from Cornerstone Custom Concrete for your concrete patio project, please fill in a bid request.